The Wabbit had been asked to contribute to an Acker Bilk concert and as he took the stage beside the great jazz legend, he was trying to hide his nerves. He searched desperately in his fur and finally found something suitable. "Haven’t played this in a while," he chortled and he whacked a harmonica against his fur. "A clarinet and harmonica together?" asked Lapinette. "Oh yes, it’s quite the thing," said the Wabbit and he turned to Acker Bilk. Acker nodded gravely, lifted his clarinet and played a few notes. The Wabbit’s harmonica wailed. Then they both smiled as Lapinette lifted a paw. "A one, and a two and a one, two, three," rapped Lapinette and they started to play. Acker’s mellow notes filled the auditorium and Lapinette began to sing. "Won't you come along with me, to the Mississippi." Lapinette’s voice was husky, "We'll take a boat to the land of dreams. Steam down the river, down to New Orleans." The Wabbit's harmonica called plaintively and then he sang. "Oh, she’s glad to be, oh yes-sirree" "Where welcome's free and dear to me," crooned Lapinette. "Where she can lose .." sang the Wabbit and paused. "Lose my Basin Street Blues," sang Lapinette. 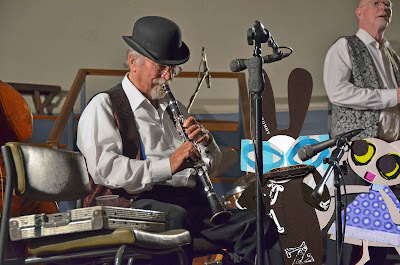 Acker’s clarinet sang hauntingly and the Wabbit’s voice harmonised in a compatible single chord, descending in half steps. "Is that a line cliché?" asked Lapinette. "Works every time," sang the Wabbit.